This ciborium is one of the most important survivals of English metalwork from the twelfth century. A ciborium was used in church as a secure container for storing consecrated bread (the Host). It is enamelled with complex imagery consisting of complementary scenes from the Old Testament (on the bowl) and the New Testament (on the lid), all accompanied by rhyming verses in Latin. Image programmes of this sort were common on large and small-scale works of art in the twelfth century, reflecting a taste for learned and literate imagery amongst bishops, abbots and other clerics. There is a tradition that in the sixteenth century, this piece was given to Sir James Balfour of Pittendreich by Mary Queen of Scots. Mary may have received it as booty after the defeat of the Earl of Huntly in 1562, and it may possibly be identical with the laver 'with a cowp and cover of copper ennamaillet" listed in her inventory of that year. 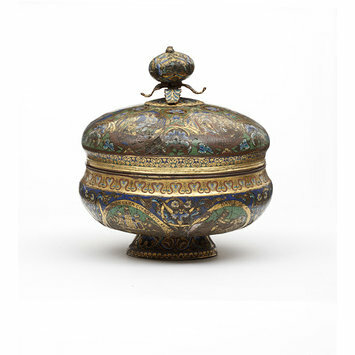 A ciborium, comprising a footed bowl and cover, decorated in champlevé enamel. The cover depicting six scenes from the Life of Christ and the bowl six Old Testament scenes. The scenes are enclosed in a continuous stem which bears inscriptions in Leonine verse relating to the subjects, and branches out into rich floral motifs in the spandrels. There are extensive areas of damage to the enamel and gilding, particularly of the bowl. The first three inscriptions are taken from frames of the New Testament scenes on the cover, reading anticlockwise (relating to the Crucifixion, the Harrowing of Hell, the Ascension). The second three inscriptions are are placed on the frames of the scenes on the bowl (relating to the Sacrifice of Isaac, David slaying the Bear, and the Fiery Chariot of Elijah). There is an undocumented tradition that the ciborium was given to Sir James Balfour of Pittendreich by Mary Queen of Scots. Mary may have received it as booty after the defeat of the Earl of Huntly in 1562, and it may be identical with the laver 'with a cowp and cover of copper ennamaillet" listed in her inventory of that year. It was then in the collection of successive Lords Balfour of Burleigh until its purchase by the Museum. The early history of the object is undocumented. However, the series of verses, some of them incomplete, which form a commentary to the scenes, are known to be based on verses formerly represented in the Norman Chapter House at Worcester Abbey (now Cathedral). These verses described a sequence of either paintings or stained glass windows. This fact, along with the English associations of related works, such as the Morgan and Warwick ciboria, and a crozier now in Florence, provide convincing evidence in favour of this piece having been made in England, possibly in the West of England. 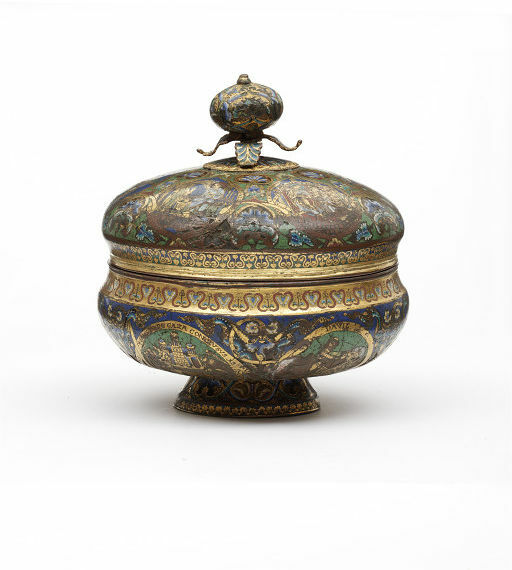 The Balfour ciborium is the best preserved of a group of three English romanesque enamelled ciboria, the others being the Warwick Ciborium (also in the V&A) and the Morgan ciborium (now in the Pierpont Morgan Library, New York). All three pieces use the verses from the Worcester Chapter House, and all three have (or had) similar programmes of typological scenes (i.e. juxtaposing events in the New Testament with events in the Old Testament). The style and execution of all three pieces are closely related, and it has been suggested that the Balfour ciborium is by the same artist as the Morgan ciborium. The artists, although working in England, seem to have been aware of technical and stylistic developments in mainland Europe, particularly in the Mosan region. Historical significance: This is one of the most important and famous pieces of English late Romanesque goldsmiths' work. It is one of the prime examples of a small group of twelfth century English enamels, which includes two other ciboria (the Warwick and Morgan ciboria), along with other works such as a crozier now in Florence, the 'Liberal Arts' casket in the V&A, and an enamelled casket now in Boston, Mass. The stylistic and iconographic parallels with contemporary English manuscript paintings, such as those in the Dover Bible, underline the close associations between figurative and decorative styles in all media at this period. More significantly, the ciborium preserves a type of decoration - the systematic typological paralleling of Old and New Testament scenes, with explanatory verses - that we know was also popular in monumental contexts in England, but which have not survived on this scale. The paintings or stained glass in Worcester were not the only images of this type in English Benedictine contexts - similar programmes of images existed in Bury St Edmunds, Canterbury and Peterborough, although these all used different verses. 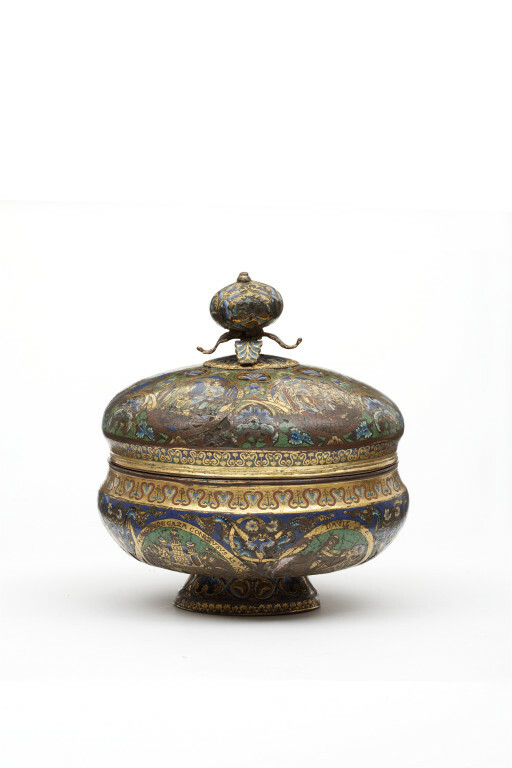 The Balfour ciborium demonstrates that such systematic image programmes were considered equally applicable to small scale works of art, reflecting what might be characterised as a taste for learned and literate imagery amongst certain clerics at this period. Ciboria are covered vessels for holding consecrated bread (Hosts). Once the bread has been consecrated it has become the actual body of Christ, and therefore, it is important to keep it safe from any mishap or contamination. Two types of vessel are used in the church for reserving consecrated Hosts: the pyx is a smaller container, often circular, whilst the ciborium is rather larger, and takes the form of a cup and cover. Today, the distinction in function between the two tends to be that the pyx is regarded as a more portable object, whilst the ciborium is used more for storing Hosts on the altar before distributing them around the congregation. It is unclear whether this distinction was applied in the medieval period. Some ciboria were locked and suspended above altars on chains. Although the Balfour ciborium retains no evidence of this, the related Morgan ciborium in New York once had a suspension loop, which has since been removed. It is unclear whether this loop was original to the object. The large size of the Balfour ciborium may indicate that it was intended for use at those times (such as Easter), when whole congregations took communion. The piece is dated on stylistic and technical grounds, and can probably be narrowed down to the period 1160 (when the Stavelot portable altar was probably made) to ca. 1170 (when the similarly laid-out paintings on the choir vault of the Hospital chapel at Petit-Quévilly, Rouen, were executed). The relationship of the verses on the ciborium with verses known to have been represented in paintings or stained glass at the Chapter House of Worcester Cathedral priory suggests that the ciborium might have been made in the West of England.